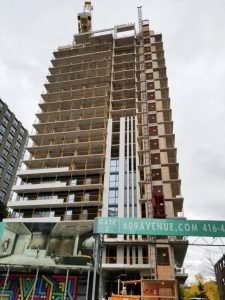 609 Avenue Road – Cladding Underway! It has been just over a year since we last checked in on construction for State Building Group and Madison Groups‘ 609 Avenue Road, a 19-storey Richmond Architects-designed condo tower underway on Avenue Road north of St. Clair in Midtown Toronto. At the time of our last update, excavation had wrapped up and a tower crane was being installed to start forming of the tower. 13 months later, and a lot has happened. Recently topped out at its final 66-metre height, installation of the building’s cladding has begun. 609 Avenue Road is being clad in a mix of window wall with gray spandrel framed in slender mullions, while white precast concrete panels add vertical accents, currently stretching as high as the 10th floor. With forming of the tower wrapped up, cladding installation will continue to enclose the building over the next few months, allowing interior work on the condominium units and amenity spaces to progress as spaces are sealed off from the elements. 609 Avenue Road will add 161 new condominium units to the neighbourhood, with unit sizes ranging between 500 ft² and 2,000 ft². The building will offer residents a selection of amenity spaces featuring interiors by Tomas Pearce, including a media lounge, a fitness centre, a pet wash station, a party room, a private dining room, and an outdoor rooftop amenity.